A multimedia collection of cases with interstitial lung diseases (ILDs) built at the University Hospitals of Geneva (HUG) is made publicly available. The dataset contains high-resolution computed tomography (HRCT) image series with three-dimensional annotated regions of pathological lung tissue along with clinical parameters from patients with pathologically proven diagnoses of ILDs. The motivations for this work is to palliate the lack of publicly available collections of ILD cases to serve as a basis for the development and evaluation of image-based computerized diagnostic aid. After 38 months of data collection, the library contains 128 patients affected with one of the 13 histological diagnoses of ILDs, 108 image series with more than 41liters of annotated lung tissue patterns as well as a comprehensive set of 99 clinical parameters related to ILDs. The database is available for research on request and after signature of a license agreement. A comprehensive description of the dataset can be found in this paper. The data can be accessed after sending the signed end-user copyright agreement by email to: adrien.depeursinge at hevs.ch. 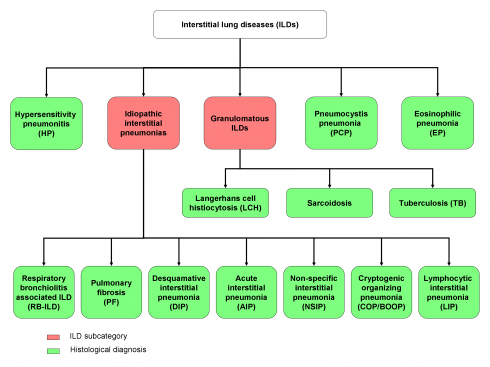 “Building a reference multimedia database for interstitial lung diseases“. Depeursinge A, Vargas A, Platon A, Geissbuhler A, Poletti PA, Müller H. In: Computerized Medical Imaging and Graphics, 36(3):227-238, 2012.